Do monks have a gempukku ceremony? As you can see, the second quote in this question seems to answer the question. If you look at the edit history, you can see that I didn't actually posted this quote, it was added during an edit. This quote is very relevant to this question of course, but I thought it would be better to put it in an answer, because as it is, it looks like my question makes no sense. Should I revert this edit? Feel free to undo the edit if you feel that it changes your question too much. 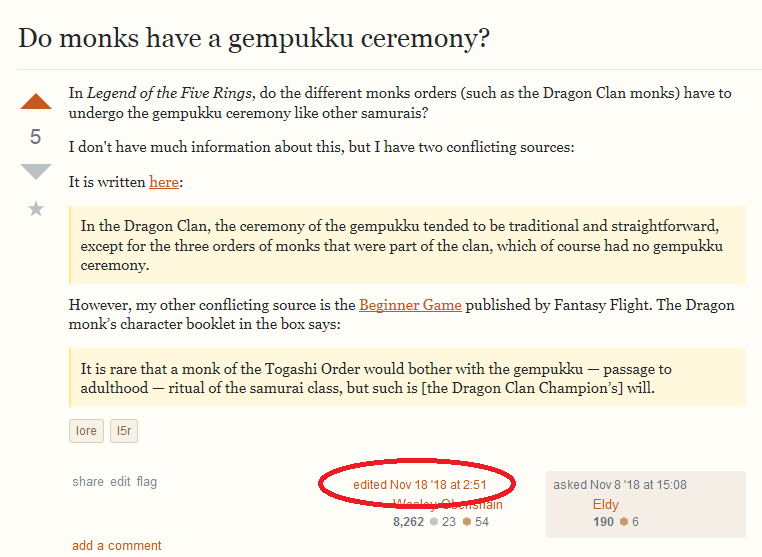 I wouldn't say that it make it looks like your question makes no sense, but it adds to the confusion: the first quote says that the monks of Dragon Clan have no gempukku, the second that they do not bother with it, which is different. But that's your question, if you don't like the edit, feel free to revert it. You can do that by clicking on the last 'Edited [Date]' mention under your post, then click on the rollback link on the various edits to your question. For a question that has been edited several times, you can choose which version you want to go back to, which also gives you the possibility to rollback everything and go back to the original post of the question. Not the answer you're looking for? Browse other questions tagged discussion specific-question editing . Is this a good or a bad example of changing tags? Should this knowledge check question have the [dnd-4e] tag? How to handle the case if the closure of my question was clearly a misuse of VtC power against newcomers? My question was closed as too broad, but I thought it was very filtered and refined. Why? How to handle late updates to answers for questions? How should we fix the Monster Lore Compendium question? Why was my comment requesting clarification on an answer deleted? Should resolved comment conversations that revolve around improving an answer be kept or deleted?